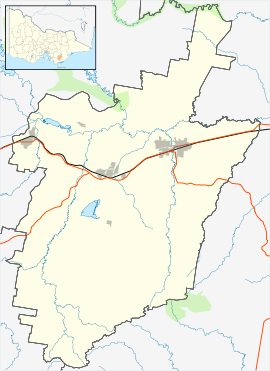 Glengarry is a town in the Gippsland region of Victoria, Australia. The town is located in the City of Latrobe local government area, 165 kilometres (103 mi) south east of the state capital, Melbourne. At the 2011 census, Glengarry had a population of 692. Glengarry was established after the railway arrived from Traralgon in 1883. The Post Office opened on 1 January 1884 as La Trobe Railway Station and was renamed Glengarry in December of that year. The town has an Australian Rules football team competing in the North Gippsland Football League. ^ a b Australian Bureau of Statistics (31 October 2012). "Glengarry (L) (Urban Centre/Locality)". 2011 Census QuickStats. Retrieved 2016-10-04. This page was last edited on 11 June 2017, at 13:11 (UTC).